Kaki turned sixty-seven last summer. Her children were married and had left home. Her husband, a retired army officer, was more cantankerous than ever before; a wife beater and a bully, he had no one except the docile Kaki upon whom he could vent his erratic and ominous temper. Kaki sought refuge in her childhood memories. Alas! These memories were far from being joyful and bright. She recalled the often quoted proverb of her mother ‘out of the mouths of babes and sucklings comes forth the truth’. However, Kaki was a special child. She rarely talked, not because sometimes the truth is better left unsaid but simply because she was afraid. She was scared of telling the truth. She was scared of being accused of telling lies. At an early age, Kaki became aware that she was endowed with a generous dose of acuity. She unwittingly watched and read the faces and mannerism of the people around her. This was how she found out about a sordid affair between her widowed grandmother and the dandy gentleman with the gold chain watch. Kaki’s grandma was a stern and authoritative woman. She was feared by all. She married a widower when she was fourteen and inherited a family of eight children. She procreate an additional eight kids. When Kaki’s grandfather passed, her grandma was a young woman bursting with feline energy. She heartily accepted to take Kaki under her charge when Kaki’s mother left this world. The gentleman paid irregular, nocturnal visits to her grandma. When he came, Kaki sat silently on a small wooden bench in the kitchen and shared with the two adults, the warmth of blazing charcoals in the hearth. They talked and laughed at the same time as they enjoyed the home-brewed coffee which her grandma stealthily hid in a tin jar kept in a small cabinet under the stove. The jar was removed from its secret place only on the arrival of the gentleman. Kaki watched them dreamily. On these special occasions grandma was particularly attentive and caring to Kaki. She unreservedly treated her with a bowl of fresh boiled and creamy cow’s milk. A really scrumptious beverage for the child! She slurped the thick drink, licking the bowl clean. She never recalled when she fell asleep and who carried her to bed. Unhappily, in next to no time, that which looked like a fairy tale to Kaki turned out to be a horror story. One dark and silent night, Kaki was sleeping in her bed; her tiny toes touched what felt like the soft, warm and moist belly of a puppy. She woke up and found the gentleman, in his birthday suit, sleeping soundly at her feet. She sat up in shock! She did not scream; she did not shriek. She was too terrified to utter a sound. As a consequence of the traumatic experience, she became a victim of severe panic attacks. She dreaded the reunion in the kitchen and she shuddered with anxiety every time she slipped under her blanket. Nervous and wretched, she got into the psychosomatic habit of lying in bed in the fetus posture. The nightmarish incident repeated itself several times in the coming months or probably years. The trust and confidence which Kaki had placed in adults were lost forever. She hated them. As her mental health deteriorated, she became pale, sad, aloof, forlorn and insomniac. But inhibited by an overpowering emotion of fear, she kept quiet about her condition and suffered quietly. On the other hand, the grandmother of Kaki and the gentleman continued to see each other for a good number of years. No one ever learned about their clandestine liaison. I embarked on a spiritual journey last spring and headed towards an ashram in search of self enquiry. My destination was India, a country known for its vast spiritual heritage. I carried in my luggage the minimal personal effects including a pair of old thongs. This search for the Truth of Oneself will, in my mind, be restrictive on personal wants and needs. Two days after I had rambled around in my old thongs, I noticed that part of the right sole was coming off; I brought it closer to my eyes to have a microscopic view of the damage; I then perceived that there was another problem; the strap which run from between the big toe and the second toe to the right side of the sandal was threading off and thinning. I sadly told myself that the thongs had expired due to old age, wear and tear. It was essential for me to look for new thongs before the expired ones left me half-way. Opportunity knocked when the next morning I walked into a store to buy fruit juice. An array of attractive and colorful thongs was displayed on a self. I tried a few pairs until I fell on one which fitted perfectly. I settled my bill, removed the new thongs from the box, glided my feet into them and placed the expired ones into the carton to throw away. Strangely, I could not find a dustbin and the expired thongs slept in the box under my bed almost forgotten. Time passed by. For the festival of Mahashivratri, innumerable pilgrims arrived in the ashram from all over the world. One night, I misplaced my new thongs. I immediately run for the rescue of the expired ones. I had been advised by a physician to walk barefoot which was supposedly a good exercise for different types of inflammation and beneficial for my sore knees, but accustomed to the western way of life, I found it hard to hop around like a grasshopper without footwear. Eventually, the expired thongs silently resumed their job of transporting me. Every time I came out of a hall or canteen where footwear was not allowed, my eyes fell on them waiting for me, tattered yet so warm. They were serving submissively and devotedly like old wives. I left them here and there, under the nose of everyone but nobody touched them. They were too old to draw attention or to be stolen. Expired they were, in the eyes of all except in mine. What a startling spiritual lesson to learn! 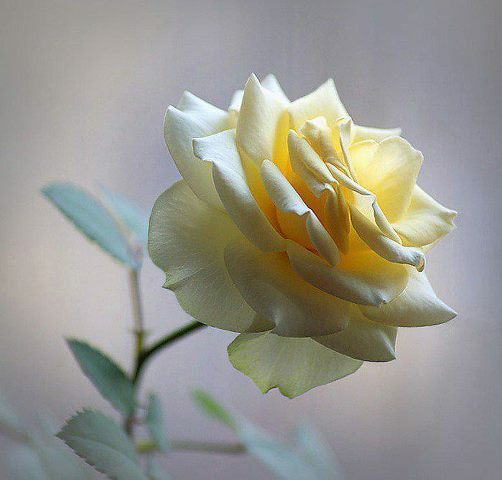 Respect and hold on to the old; in times of need, they are the most helpful. Further, nothing ever happens accidently or mysteriously, spiritual life shows us. For every happening, there is a proper reason. Moreover we are taught that inanimate objects too have feelings and emotions. For instance, it is told in the sacred Hindu book ‘The Ramayana’ that when Lord Rama went to rescue his wife Sita from the demon King Ravana, an army of monkeys came to his help. They built a bridge by plucking mountains from the Himalayas and throwing them into the seas to allow Rama to walk from his land to the realm of Ravana. When the bridge was done, one mountain cried because it was plucked from its original place but not used. 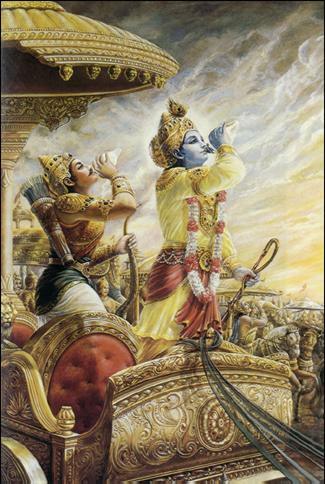 Lord Rama then promised the mountain that in his next Avatara, it will receive his blessings. This very mountain was the Govardhana Peak which Rama as the Avatar Krishna lifted on his finger and held aloft for seven days in order to save the inhabitants of Gokul from the devastation of torrential rain. To cut a long story short, I returned home with the expired thongs, having learnt that self enquiry leads one to detach from people, mundane life and affairs by opening one’s eyes to the deficiencies in them. Zillions of pilgrims flock to Kasi, where there is a shrine of Lord Shiva. It is believed that those who visit this sacred place will gain ‘moksha’ liberation and will escape the cycle of life and death. They will, in other words, win a place in Kailasa, the abode of Shiva. Lord Shiva and Parvati then disguised themselves and came down to Kasi. Parvati, as a shriveled old hag, sat on the step of the Shiva temple and Lord Shiva, as a wizened old man, lay thirsty and crying for water in her lap. Pilgrims were carrying the sacred water of the Ganges in silver vessels to pour on the Shiva Lingam in the temple as an offering to Lord Shiva. She wept and implored them to drop some water in the lips of her poor husband. Some looked at her pathetically and walked their way. Others said that they would bring some water only when they return from prayers and offerings to God. No one was willing to use the sacred water which they had collected to quench the thirst of the old man. In their mind, it was meant for God and it would be a sacrilege to offer it to a mendicant. In so saying, he placed the gourd to the lips of the old man and poured a guzzle of water. 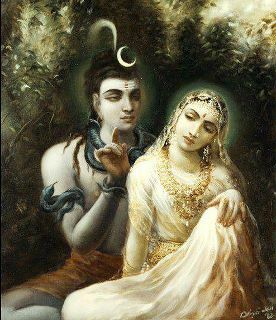 Then and there, the old couple disappeared and in their place stood Lord Shiva and Goddess Parvati in all their majesty, blessing the thief.